Before Aiesha Eddins got pregnant, she didn't give much thought to her diet. "I ate whatever," said the 27-year-old Owings Mills woman. "We ordered take-out." But when she weighed in at 220 pounds during her initial prenatal visit, she quickly earned a spot at the Johns Hopkins Hospital's Nutrition in Pregnancy Clinic, launched in December to counsel and treat obese women. The clinic has around a dozen patients but already is expanding. An estimated one in five pregnant women are obese, according to the U.S. Centers for Disease Control and Prevention, an epidemic according to some doctors who have begun to buck conventional ideas about "eating for two." They now recommend healthy diets, little or no weight gain and even bariatric surgery for obese women before they get pregnant. Obese pregnant women are at increased risk of miscarriage, high blood pressure, diabetes, pre-term delivery, stillbirth, cesarean section and other problems. Their babies, which are harder to see on ultrasounds, are more likely to be obese and diabetic and have other maladies. Conventional advice for these women since 2009 has been to gain 11 to 20 pounds, reflecting guidance from the Institute of Medicine, the influential federal advisory panel. Normal weight women are told to gain 25 to 35 pounds. Most doctors generally stick to the guidance and treat obesity complications, said Dr. Janice Henderson, an obstetrician for high-risk pregnancies at Johns Hopkins Bayview Medical Center and Eddins' doctor. But she said some doctors have begun to see that as a "missed opportunity" to teach patients about nutritional and lifestyle changes that can improve their and their babies' health. Eddins was counseled to eat more fruits, vegetables and whole grains. Now seven months pregnant, she's lost 20 pounds. "Over the course of a pregnancy they learn a lot that we hope will have a carry-over effect postpartum both for themselves, their child, and perhaps even spill over to other family members," Henderson said about the women in the Hopkins clinic. 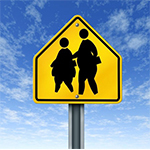 "Imagine if we don't begin to address this problem what the next generation or the generation after that will look like with respect to obesity rates." Henderson said some women gain too much weight in pregnancy, but most already are overweight. Federal statistics show that nearly a third of women of reproductive age are obese, and the numbers are higher among minorities. Obese pregnant women are all considered high risk for complications, doctors say. And they are filling high-risk centers, such as Mercy Medical Center's Center for Advanced Fetal Care. The center also treats women with diseases or infections, who are carrying twins or who are older than 35, but half of the women are obese, said Dr. Robert Atlas, chair of Mercy's obstetrics and gynecology department and an assistant professor at the University of Maryland School of Medicine. Many of the women come from impoverished areas of Baltimore and don't have ready access to good food or have developed poor eating habits, he said. If he can impress one thing on them, Atlas said, it's to not drink sugary soda or even juice. "I don't want obese patients to gain any weight," he said. "I don't use the term dieting, but I tell them to eat healthy." He's learned about nutrition in part from battling his own weight. But he conceded he's not a nutritionist, and insurance doesn't often pay for women to see one unless the patient is diabetic, which an increasing number of obese patient are. That lack of nutrition training means many doctors don't give full or even proper advice to patients, said Dr. Yvonne S. Thornton, a professor of clinical obstetrics and gynecology at New York Medical College. Thornton first learned about nutrition from a commercial weight loss center, where she went after her first baby was born. It was an experience she translated not only into advice for obese patients but also into a study proving that little to no weight gain was safe. Thornton was using Weight Watchers when she became pregnant again. She intentionally gained no weight during this pregnancy and quickly lost weight afterward. Neither she nor the baby had any complications, so she decided to seek permission from her hospital review board to let her conduct a similar experiment on patients. "It took years to convince them," she said. "They all thought, as many people did, that dieting would harm or kill the baby." Once she was allowed to do the study, her patients ate a healthy diet and gained little or no weight. They had significantly lower rates of high blood pressure, diabetes, miscarriage, early delivery and infant death. She now encourages other doctors to counsel patients on nutrition and wants the Institute of Medicine to change its recommendations on weight gain. The institute has not been formally charged by a federal agency or outside group to revisit the guidelines, a requisite for a new study. But the body of research doesn't yet show that gaining no weight is safe and effective, said Kathleen M. Rasmussen, professor of nutrition at Cornell University and chair of the committee that conducted the last review. "However, doctors can certainly still apply their best clinical judgment for a given case and provide nutritional support for a heavier woman to gain less," she said. Another committee member also questioned the safety of weight loss. Doctors should continue to follow the guidelines until further research is available, said Dr. Patrick M. Catalano, chairman of the Department of Obstetrics and Gynecology at Case Western University at MetroHealth Medical Center in Cleveland. But Thornton argues that studies already show a better diet, with or without weight loss, is safe. A recent study conducted in Europe and published in BMJ Journals concluded obese women could diet safely with the direction of health professionals. And calorie restriction was more effective than exercise to control weight gain. The study found that women who restricted their calories were a third less likely to develop pre-eclampsia, among the most dangerous complications because it can severely raise blood pressure. The women were also 60 percent less likely to develop gestational diabetes, 70 percent less likely to have high blood pressure and 32 percent less likely to deliver early. Babies' birth weights were not affected. Such information may be motivational to pregnant women, but the study's authors acknowledged changing eating habits is hard. Indeed, the CDC says 57 percent of obese women gained excessive weight in pregnancy, or more than 20 pounds above current recommendations. Eddins said it was hard to change after a lifetime of poor eating choices. But she plans to continue losing weight after the baby is born. "At first I was surprised they didn't want me to gain any weight," she said of doctors' advice. "But now I eat strawberries, bananas and grapes. I drink milk, I eat chicken. I feel good. ... I have the willpower because I want to do what's healthy for my baby." Ideally, doctors say women such as Eddins should be counseled on weight and nutrition before they become pregnant, though about half of pregnancies are unplanned. That's the ideal time to lose weight, though many women will think "why bother" because they will be gaining weight in pregnancy, said Dr. Roxanne Jamshidi, a Johns Hopkins Bayview obstetrician. Jamshidi is among the doctors recommending that some women who can't lose weight another way have bariatric surgery before conception. The surgery can increase fertility, and some may need it to become pregnant, she said. The surgical procedures include a band on the stomach or gastric bypass and can quickly restore normal ovulation and conception chances, she said. A recent study in which Jamshidi participated also showed the surgery reduced pregnancy complications. "Many women have already failed with other weight loss attempts," she said. "For some, surgery is the only thing that works. ... Even if they are still obese, but they're 100 pounds less obese, they do better in pregnancy."